Milk yield loss and impaired reproductive performance are the primary contributors to the loss of around 0.3ppl from every litre from every cow in the herd from digital dermatitis each year. Considering its association with interdigital growths, severe lesions such as necrotic toe and wall lesions, severe heel erosion, sole ulcers, severe cases of foul-in-the-foot, teat necrosis and udder sores then £3000 for every 100 cows in the herd may even be a conservative loss associated with digital dermatitis. Data from the National Animal Disease Information Service (NADIS) suggests that in herds infected with digital dermatitis approximately 40% of cattle typically have heel lesions and recent steps to introduce a five-point plan across the industry to reduce its prevalence sees frequent disinfection to reduce new cases as fundamental to the longer-term control of this infectious disease. Stringent biosecurity measures for purchased animals or visitors who may be carrying infection on boots or hoof trimming equipment for example, plus internal biosecurity to minimise infection pressure on cows through exposure to manure, minimising standing times, ensuring walking surfaces are maintained and infected cows are segregated are simple steps to implement. Due to its infectious nature in cattle then rapid treatment and cure are important on farm, although it is easier and better for animal health and herd profitability to prevent infection in the first instance. Where infection is severe then topical treatment through cleaning and application of a licensed antibacterial product e.g. copper gel or salicylic acid is typically successful. Many farmers use antibiotic powders in treatment and also routinely in footbaths although this is an off-license treatment and milk residues are reported. Additionally, moves to reduce routine use of antibiotics on farm should see farmers move towards a safe, and legal way of controlling such a costly disease. Preventative measures should always remain a priority and a good foot bathing routine forms an essential part of this management approach alongside recording and monitoring cases over time. From footbath design, to chemical choice, a successful foot bathing routine requires thought and design. 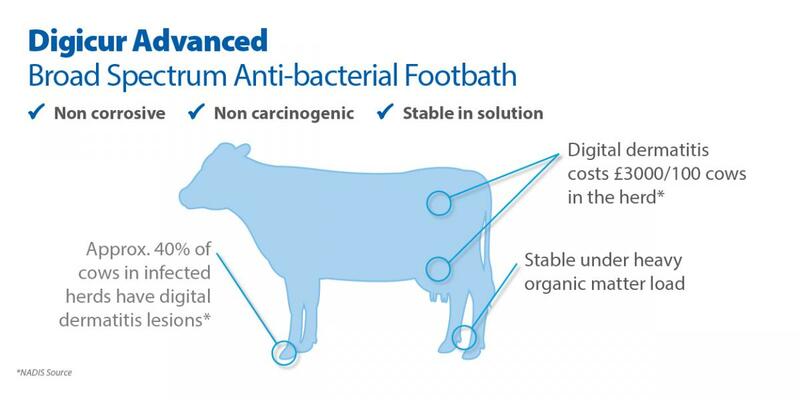 The ability of the chemical to access the relevant areas of the foot in the correct concentration for the correct duration underpins footbath effectiveness – footbath length and frequency of solution changes throughout the foot bathing period play key roles here. A footbath of at least 3 metres in length with 1 litre of fresh footbath solution available per cow e.g. a 200 litre footbath can be used for a maximum of 200 cows, enables maximum efficacy of any treatment, or prevention protocol. Ensuring all stock are included in the footbath protocol is essential – youngstock and dry cows should not be overlooked in the process. 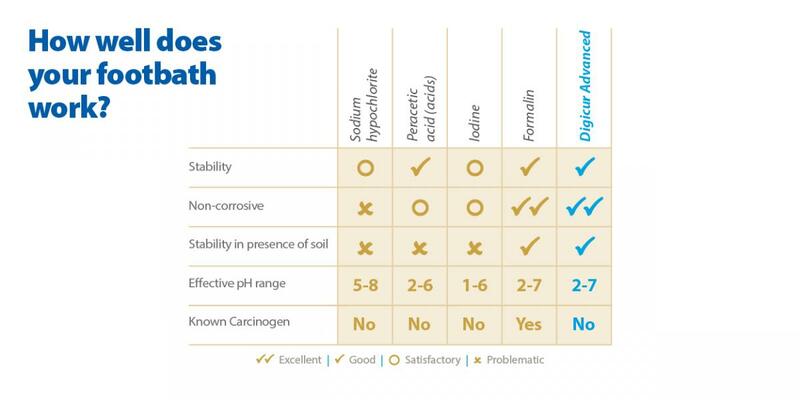 The correct choice of footbath should also not be overlooked – ensuring a product which is stable in solution for the first and last cow through, even under heavy organic matter (soil/muck) load, is a priority alongside a lack of corrosiveness especially where automatic systems are in use. Technically, aldehyde-based disinfectants are extremely effective in killing bacteria and retain their effectiveness under high organic matter loads. Commercially, this makes formalin a popular choice on farm. An aldehyde based disinfectant, formalin is both cost- and physically-effective to use, yet due to its known carcinogenic (cancer-causing) risks is becoming less trusted. Alternatives to formalin may not be as effective under high organic matter scenarios – parlour circulation waste water, peracetic acid-based products (Paraheel), formic-acid based products (Hoofsure Endurance) or iodine. Digicur Advanced differs from these products – it contains glutaraldehyde as its active ingredient, a derivative of the same aldehyde base as formalin, which offers all of the same characteristics as formalin such as a broad spectrum bacterial effect, is not corrosive when diluted and performs well under extreme challenge but without the carcinogenic risks. Lameness caused by digital dermatitis is all too often a profit stealing disease on farm whose presence is found on most UK farms and implicated in more than just typical digital dermatitis cases – control and even treatment can be straightforward when done regularly via foot bathing so ensuring you use an effective product without adding risk to stock or staff is now a reality not an aspiration with Digicur Advanced.